Gonna Go Back in Time! So, I was not feeling at all well this weekend and missed my Saturday post for the Ornament Advent. To make up for it, I decided to splurge and make a slightly more difficult ornament. 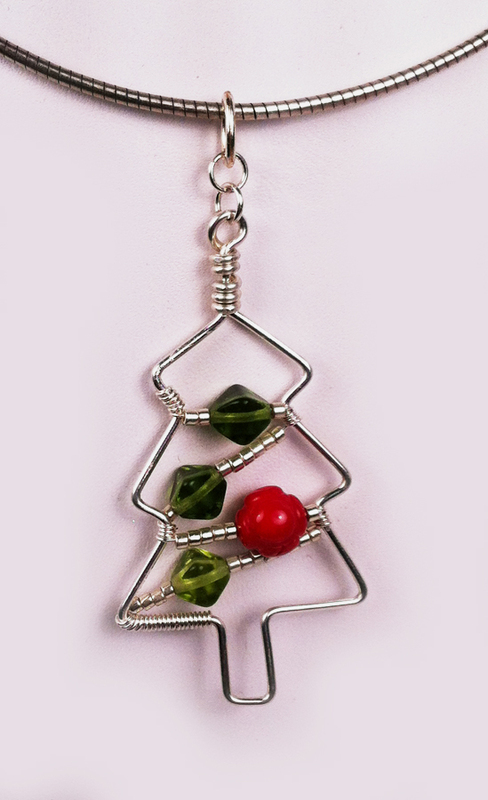 For this ornament, I once again raided my temari ball stash and used one of the green balls for the base. It is around 3″ in diameter. I then wrapped the ribbon around the ball tacking it down first with pins and then with basting stitches. The beads are from the giant spinner of seed beads that Mom and I bought to take with us when we went camping (yes, we like to craft while camping). I strung the beads and crossed under the ribbon, trying to make a slight draping effect while doing so. It was interesting how much heavier the ball got by the time I was finished. All those glass beads weigh more than you would think. I then decided that I needed a bead topper and found a lovely smoky gray glass bead in my oddments and leftovers drawer that looks great. I made the hook and I was ready to go. I am really pleased with how this one turned out. I have so many unfinished projects. I was looking through the pile of them with my mother-in-law last weekend and I couldn’t believe how much material I had there. So much of it needed to be cut up completely. However, some of it just needed to be finished. I pulled a few pieces out and am really making an effort to get them finished and here is the first finished project! 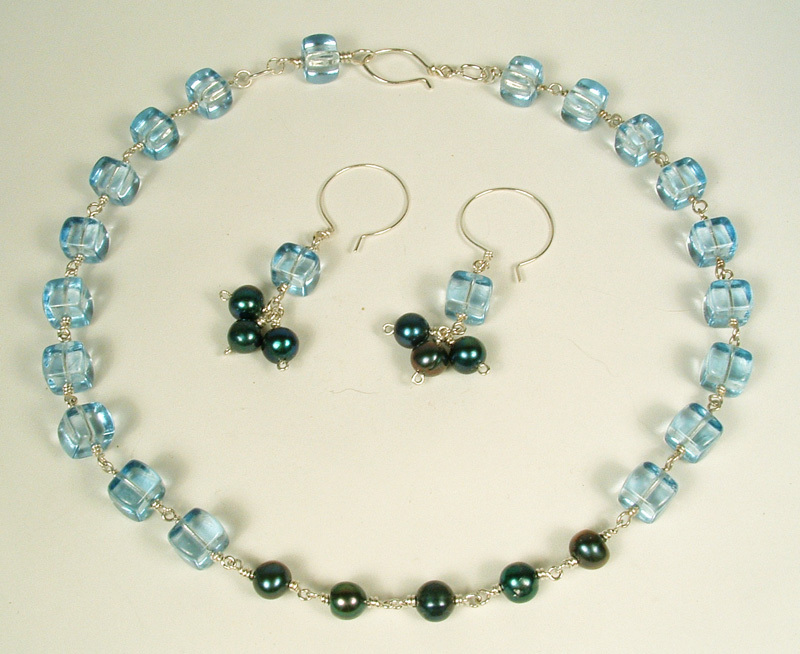 The necklace is made with sterling silver for the wraps and clasp, dark blue/teal pearl beads for the front part of the necklace and clear blue cube beads for the back part of the necklace. 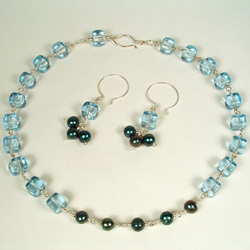 I just loved the clear blue cube beads and knew when I bought them that I wanted to wire wrap them in a strand. I started this necklace about 2 years ago and since then, I add another cube bead every now and then, but I was never quite happy with how simplistic the blue cube beads looked by themselves. I bought the blue/teal pearls last year and looked at them a lot with no real idea what to do with them. I started putting them together and just love how the finished necklace turned out! 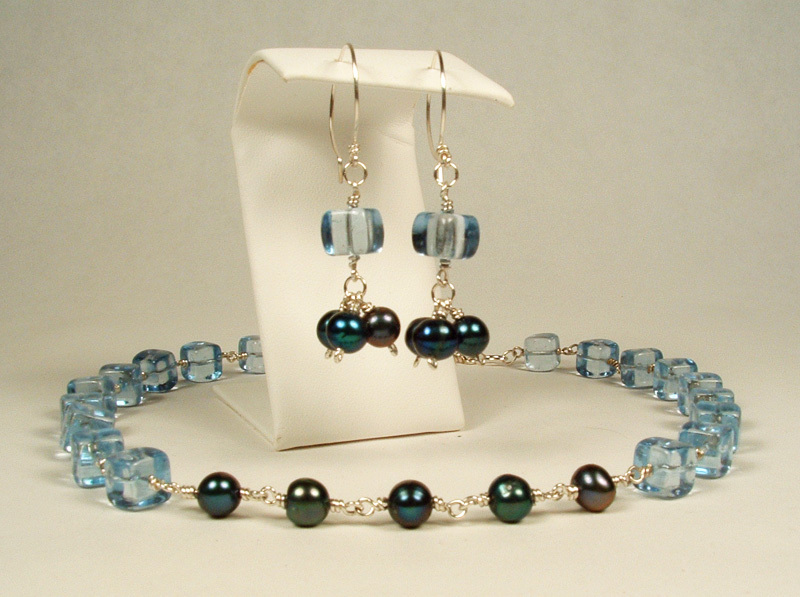 The contrast of the dark pearl with the light blue cubes just pleases me immensely. 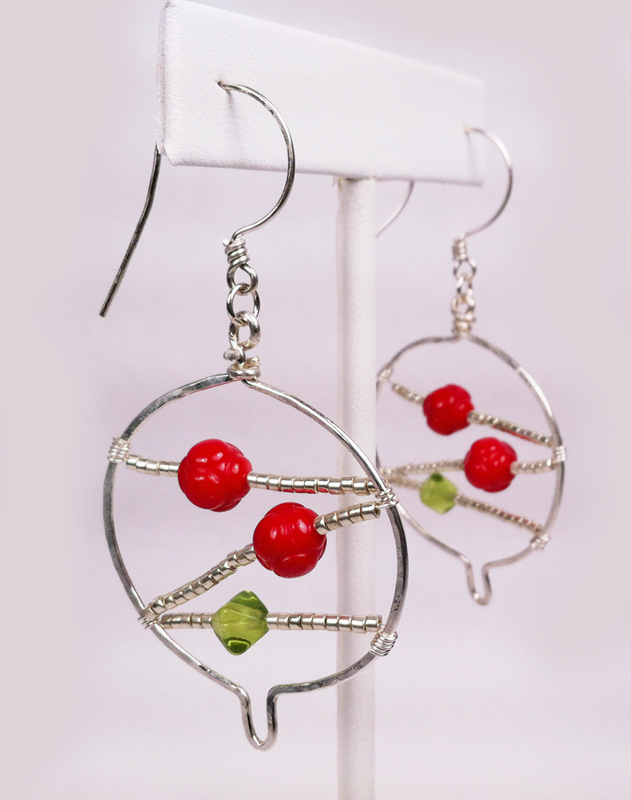 Of course, I had to make earrings to go with the necklace. 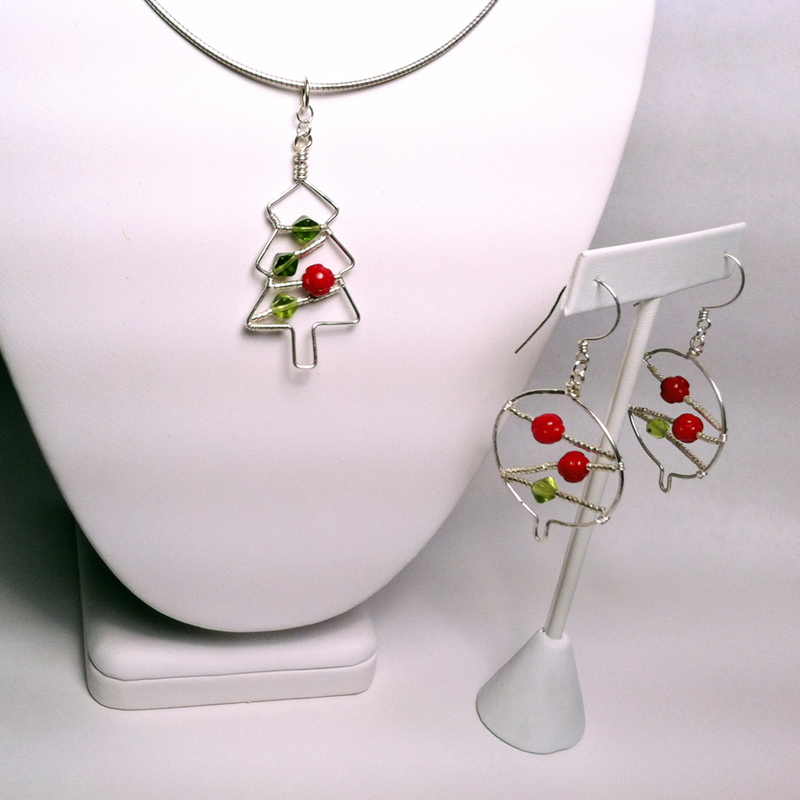 I like making matching sets of jewelry. I really like the trio of pearls below the cube bead. They swing and bounce quite happily when worn. I also made the clasp. 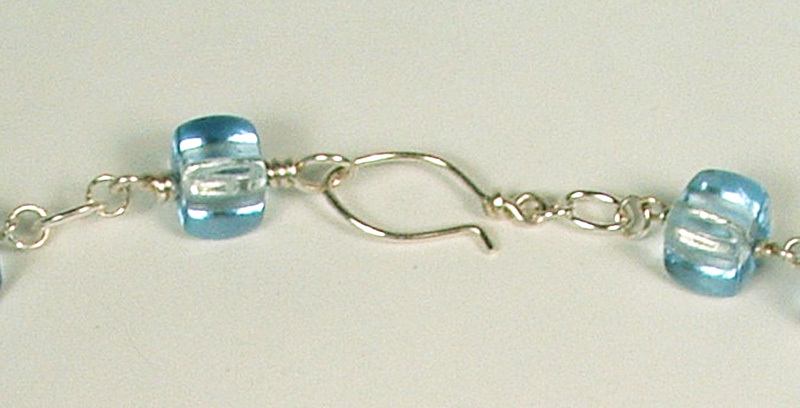 I decided I wanted something with a little more oomph than my standard clasp and made an almond-shaped clasp that had a blue cube bead wrapped in the eye half of the the clasp. I really liked how it turned out and will probably make more clasps like this one in the future. So, one unfinished project down, an infinite more to go. Mom (Craftysister Lynne) suggested I make a list and cross off my newly finished project, but I said that would just remind me of how many unfinished projects I still have yet to complete.